The Ottobock Start XXL is the ideal choice for larger individuals, supporting loads of up to 160 kilograms. 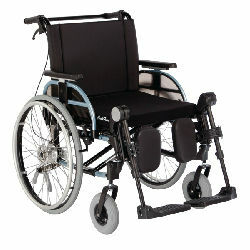 This stable wheelchair is available with a seat width of up to 58 centimeters and a seat depth of up to 49cm. A double crossbrace and rear wheels with reinforced spokes ensure strength and durability, while elements such as adjustable backrest height and adjustable rear axle position allow optimal wheelchair setup. Optional accessories include one-hand activated wheel lock system, height adjustable push handles and armrests, stump supports, elevating legrests and tray.